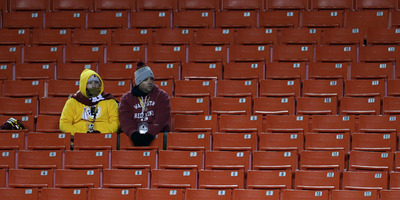 Patrick Smith/Getty ImagesFor the first time in years, the Redskins are selling single-game tickets to fans. The Washington Redskins are offering single-game tickets to fans this year for the first time in recent memory. Washington claimed years ago to have a waitlist of up to 200,000 fans hoping to get season tickets, despite regularly removing seats from FedEx Field. This year, Washington announced that the waitlist was no more. Fans will be able to purchase single-game tickets directly from the team, in an effort to improve what was the league’s fourth-worst attendance percentage in 2017. The Washington Redskins will be looking for a fresh start with the 2018 season. After the departure of Kirk Cousins, Washington brought in Kansas City Chiefs quarterback Alex Smith to set a franchise that hasn’t won a playoff game since the 2005 season in a new direction. But a new face at quarterback isn’t the only change in Washington this season. After once claiming to have a waitlist of between 90,000 and 200,000 fans looking to become season-ticket holders, the Redskins announced the end of their waitlist earlier this offseason. This week, ticket availability in Washington went a step even further, with fans getting the option to purchase single-game tickets for every home game this year. As Barry Svrluga and Scott Allen at the Washington Post both noted, it’s the first time in recent memory that fans are able to get single-game tickets directly from the team rather than off of secondary markets. The Redskins had always maintained that there was an extremely high demand for season tickets. The claim of countless Washington fans clamoring for season tickets was a tough one to sell to sharp observers, who watched as the Redskins continued to remove seats from the stadium to decrease its capacity again and again. With the team now selling single-game tickets directly to its fans, it will look to turn its attendance fortunes around after filling just 88.4% of its seats last year – good for the fourth-worst percentage in the league. Despite the team’s struggle to fill the stadium last season, Lafemina sees the empty seats as an opportunity for growth. With a little more than a month until the Redskins’ home opener, there’s plenty of seats still available from the team through Ticketmaster.